Budapest is most lovely to me at this time of the year when parks, gardens are are all green and flowery. We have lots of festivals and things to do to choose from. Here is our selection. 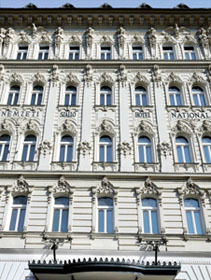 Address: Ybl Miklós tér 2 – 6., Buda, district I. If you love to stock up on some local craft produce this is the place to get them! Sausages in all variation will be in the limelight. 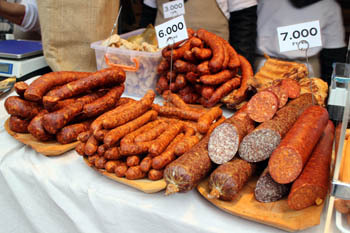 Besides sausages and other meat products, you can sample the best craft foods brought to you by Hungarian small farmers. Concerts, children performances, tastings accompany the food fair on both days. Entry is free to all programs. The square that hosts the city’s popular Christmas market has been given home to a Spring Fair too for a couple of years now. The event organized by Budapest’s official Tourist Centre is an ideal place to meet and chat with local craftsmen, and artists and buy something unique. a wide choice of food and drinks are the additional highlights of the more than 3-week Budapest Spring & Easter Fair. Spring’s biggest running event is the Vivicitta Half Marathon with the main races – 21 km and 10 km – taking place on Sunday. Saturday is dedicated to shorter distances and family programs. Note: Expect changes in public transport schedule on these two days! You can choose from a range of activities and programs in and outside the Hungarian capital during spring’s most awaited holiday. 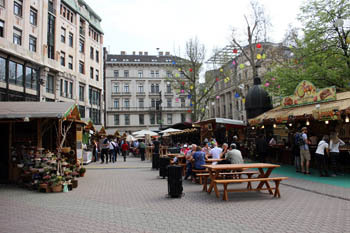 The Spring Fair on Vörösmarty tér (see below) is a centrally-located, month-long festival close to the Danube and many other must-see sights in downtown. Várkert Bazaar in Buda hosts a 3-day festival on 20 – 22. April with concerts, craft workshops and family programs. Entry and programs are free. Vajdahunyad Castle in City Park gives home to Easter Lamb Festival on 31. 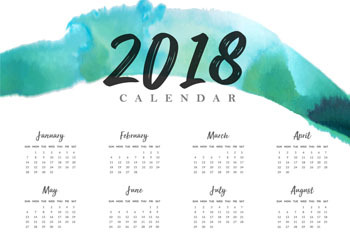 March – 01-02. April April featuring popular lamb dishes, cooking contest, craft workshop and a fair selling the usual knick-knacks. In the evenings you can go on a Sunset Cruise with Cocktails. See the city at its most charming illuminated by the setting sun and the lights. 2 large cocktails and melodies by a Gypsy orchestra ensure a great time on the 2-hour tour. Find more recommendations on Easter Things to Do in Budapest! TIP: View also our post on Easter opening hours of shops, attractions as well as information on public transport during the holiday. 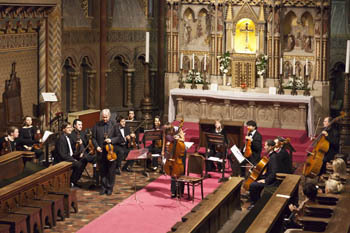 Budapest Spring Festival, 05 – 22. April 2019.
exhibitions at thirty locations in the city (Palace of Arts, Music Academy, A38 Boat, Opera House, Bálna, Hungarian National Gallery etc.). Franz Liszt‘s works will also be in the focus of the nearly 4-week program. Ticket prices to the programs vary between cc. 2500 HUF – 15.000 HUF (depending on venue and seat category). It’s good to buy tickets well in advance because lots of programs sell out quickly. See more programs on the event’s official website. Tickets: full price: 3 000 HUF, students, seniors: 2 000 HUF, family: (2 adults + max. 3 kids): 8 000 HUF. Note: You’ll receive a wristband with which you can visit all programs during the 6 days. The Budapest Art Week is a brand new series of programs that aims to inspire and provide guidance to fans of art. It’s part of the Spring Festival listed above. You can experience the thriving art world of the city in close to 50 art venues: galleries, museums, workshops, community places. talks to get an insight into Budapest’s varied art scene. The 6-day event complements the Spring Festival’s repertoire of classical art programs synchronizing nearly 60 programs to highlight the most significant and current venues of the city’s art world. 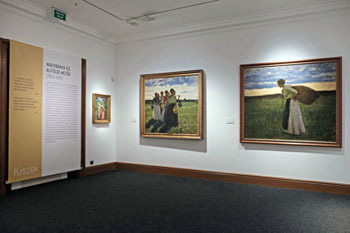 The exhibitions can be visited during the opening hours of the venues. For more information on the programs visit the event’s website. International Book Festival, 25 – 28. April, 2019. A 4-day International Book Festival is focusing on literature and books. This year Orhan Pamuk will be the guest of honour. 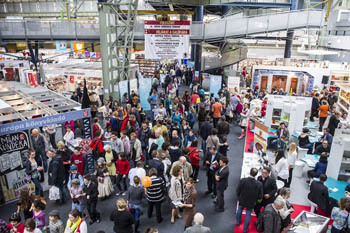 The European First Novel Festival is also organized within the Book Fest. Visit the official website of the event for more details. April is an ideal month to explore the city by walk: pleasant spring weather, warm sunny days, longer daylight hours. 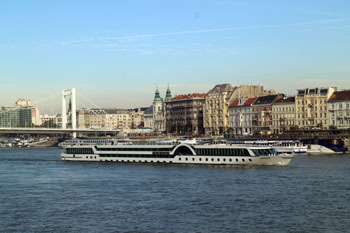 The Danube Promenade (Dunakorzó) – a riverbank on the Pest side stretching between the Chain Bridge and Elizabeth Bridge – lots of terraced cafes to have a bite or a cup of coffee. The Várkert Bazár and Gardens (Castle Bazaar & Garden) that celebratesits 3-year anniversary on 02-03. April 2017, on the Buda side at the southern foot of Castle Hill also offers plenty to see – you’ll enjoy an amazing vista on the walkways meandering on the slopes of the Neo-Renaissance garden that is in full bloom and green by mid-April. 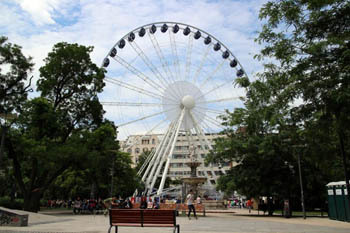 The Budapest Eye re-opened in mid-March and offers an amazing birds’ eye view of the city from its 42 cabins. The new attraction is open every day, 10.00 – 24.00, all year. April is also ideal for leisurely strolls in parks, gardens and arboretums. Here are some tips where to enjoy a bit of green in the city! 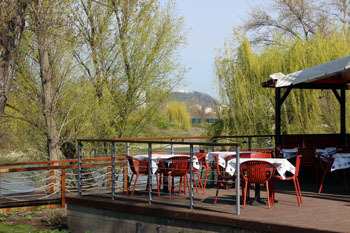 The Kopaszi Dam in southern Buda close to Rákóczi Bridge was turned from a neglected area into local’s favorite park in 2007. The 10 hectare/24.7 acre landscaped area surrounds Lágymányosi bay and is bordered by the artificial Kopaszi dam south of Rákóczi Bridge. enjoying a meal or just a drink at one of the terraces (Veranda, le Bistro, Fruska Bistro). TIP: View our photos taken on a Sunday morning in April. Find more tips on parks and arboretums in Budapest. Matthias Church, and other churches. Address: 1065 Budapest, Nagymező u. 8. You can view Hungary’s best press photos carefully curated in 14 categories. The display accurately showcases what happened in the world of politics, culture and life itself. An amazing collection of artfully painted Easter Eggs by Ildikó Fekete folk artist. 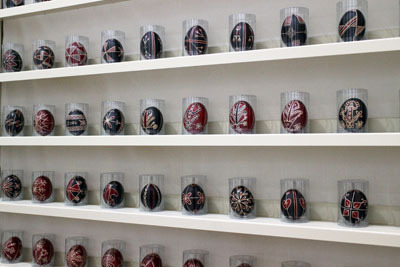 Eggs decoaretd with traditional Hungarain folk motifs demonstrate the skillfulness of people living in the countryside. If you’re in Budapest with children visit the Enchanted Island Exhibition in the Museum of Hungarian Agriculture, housed in Vajdahunyad Castle in City Park. A spectacular and exciting program with hands-on displays and fun games on 1 000 sqm. You’ll enter an enchanted tropical island and be part of a secret mission. Visitors receive a text booklet game along with a small surprise, which helps uncovering the secret step by step. Devote at least 1 – 1,5 hours to explore the displays and games. 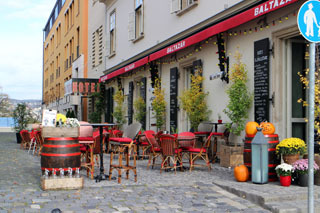 We recommend a lovely bohemian boutique hotel in Buda castle with a great restaurant and wine bar, the Baltazar Hotel in Országház utca. Pick the Lovers package with your room to surprise your loved one with a bottle of champagne, chocolate glazed strawberries and a dessert in one of three cafes of your choice. Our other pick is the Hotel Nemzeti McGallery Collection, a 4-star establishment in a historic building on the József körút part Nagykörút. The hotel belongs to the MGallery division of the Accor group, known for unique hotel all around the world highlighting local architectural and cultural characteristics. The 80-room hotel offers modern, eclectic design combined with21-st century amenities. An ideal choice if you look to stay at a place that offers something unique in a city! Baths in Budapest are a wonderful source of recreation, healing and historic ambience. You can admire the architecture and enjoy the hot pools in baths from the era of Ottoman occupation (15-17. centuries): the Király Bath and the Rudas Bath. Or you can have a great time and soak up he grandeur of two more recent spas: the Gellért in Buda and the Széchenyi in Pest. TIP: Perhaps the Szt. Lukács Thermal Bath in northern Buda (Frankel Leo u. 25-29., district II.) has the richest history and it is less touristy than the other baths. The Knights of the Order of St. John healed the sick here in a bath in the 12. century. The Turks also used the bath establishments in the 16-17. centuries, then a spa hotel was built in 1884. The bath was refurbished in recent years when new and modern facilities were added. It has both indoor and outdoor pools (with 40 deg. Celsius water temperature so you can have a dip even in winter). Venue: Várkert Bazaar, Ybl Miklós tér 2-6., Buda, distr. I. Includes unlimited tasting between 11.00 – 18.00. After 18.00 you have to pay for tasting. VinCE is central Europe’s biggest wine event with master classes, workshops and presentations in English and of course lots of tasting. The wine show moves to a new venue, the Castle Bazaar in Buda. This year you can sample the wine and distillate offer of 160 exhibitors from Hungary and the neighbouring countries. Food will be served in the food court so that you won’t have to leave the venue if you get hungry (but of course with your armband you can leave and come back whenever you want). See more details on the event’s official website.